“– 300 meters of poetry! 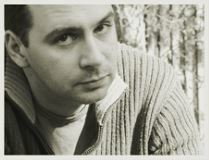 – 3,000 feet of Shakespeare!” Most of us film historians must be familiar with this line. This is how high-minded journalists used to mock cinema’s early attempts at literary adaptations. In the 1910s it was taken for granted that in the kingdom of poetry and arts there is no room for numbers and measures. Ironically, those who used to say this seem to forget that what makes poetry different from prose is its use of metric forms of speech, so feet and meters are as relevant to Shakespeare’s work as are Shakespeare’s tropes and Shakespeare’s characters. In verse studies, scholars count syllables, feet and stresses; in film studies, we time shots. "If I use one word, I would have to say timing," Chuck Norris said in a recent interview to ABC’s Nightline answering what attribute won him six karate world titles. "Timing I think was my key thing. I was able to figure out the timing to close the gap between my opponent and myself and move back, and that was I think the key." Much like martial arts, or like poetry and music, cinema is the art of timing. This explains why, early on, filmmakers as Abel Gance or Dziga Vertov in the 1920s, or as Peter Kubelka or Kurt Kren in the 1960s not only counted frames when editing, but also drew elaborate diagrams and color charts in order to visualize the rhythm of their future film. This also explains why a number of scholars interested in the history of film style (as Barry Salt in England, David Bordwell and Kristin Thompson in the US or Charles O’Brien in Canada) count shots and time film lengths to calculate the average shot lengths of the films and/or use these data in their study. What do we learn about films from calculating their average shot lengths? I once applied this method to compare the average shot length of Kuleshov’s films against the films made by his teacher Yevgenii Bauer, and when I put my data side by side with world-wide data collected by others, I felt my heart beat faster, for it turned out that between 1917 and 1918 the cutting tempo of Russian films had jumped from the slowest to the fastest in the world. Not that the difference could not be detected without all the timing and counting, but I felt proud and excited that now we could not only intuit but also demonstrate this. More recently I did a similar thing with Intolerance for Griffith Project Volume 9 (2005) – click on my article to see whether statistical data about comparative cutting rates of its four stories add something to our understanding of how this movie works. Are results we obtain using statistical data worth the time and patience one spends to obtain them? More and more so. Nowadays the process of calculating a film’s cutting rate can be made much faster and less labor-intensive than it used to be in the seventies and eighties. 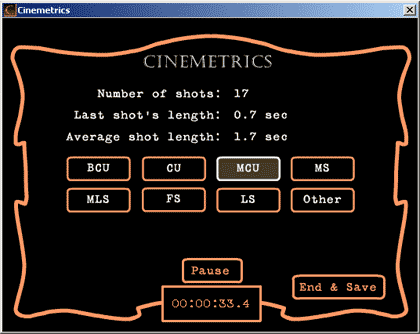 A statistician and computer scientist Gunars Civjans, whose help I used in my work with Intolerance, has created an easy software program, called CineMetrics, which makes it possible to take shot lengths in real viewing time with sufficient precision. Click to learn how it works.